I'm helping the Malaysian Association of Hotels spread word about their Kuching "treasure hunt" competition, which is gonna be held on the Sunday 23rd November, and will involve taking the participants through the tourist attractions and places of interests in and around town. Attractive prizes, including air tickets and hotel accommodation are in store for winners. If you're interested, click here for more info. You know what goes well with football? And you know what goes well with beer? But with your beer goggles on, there is a risk that "babes" you get might turn out something like this instead. For that reason, sometimes it is wiser to stay at home, enjoy your beer and have a safer type of fun. Like playing some beer-flavoured internet flash games on the internet with your friends. 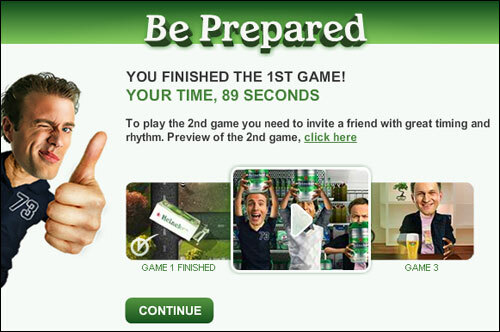 Heineken Beer, the sponsor of UEFA Champions League has came up with a series of internet flash games so strangely interesting, it got me thinking. 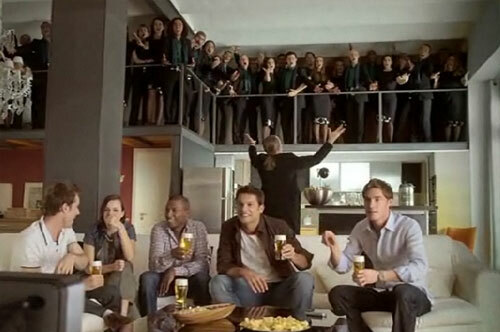 What exacty were the executives at Heineken HQ drinking when they came up with these ideas? 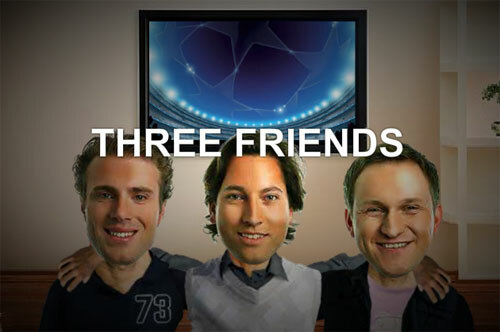 The series of three flash games are up at the Heineken Champions League Great Together website. 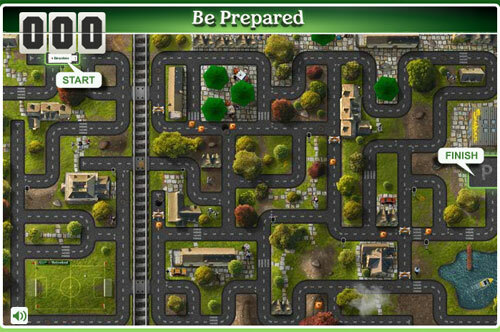 In the first game, you have to use your skillz to navigate a Heineken beer truck through a maze to reach the supermarket in the least amount of time possible. 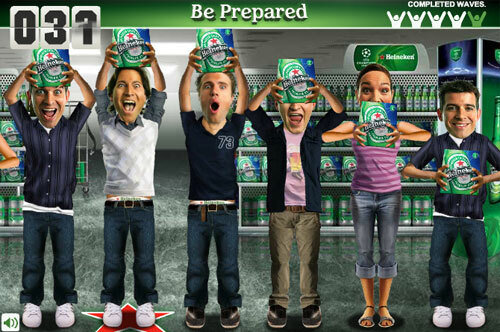 In the second game, you must use your skillz to do a Mexican Wave inside the supermarket in order to bring the beer back home. 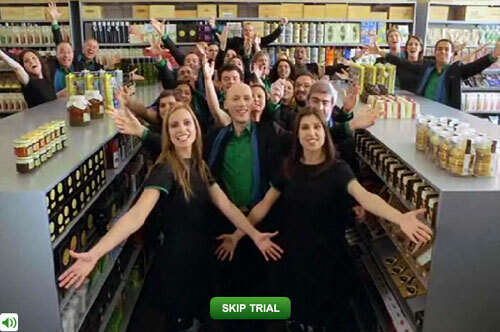 Dunno what kinda supermarket allows you to do that. Surely it's not Everrise. In the final game, you must slide and catch the beer over the bar counter without breaking any bottles. If you managed to catch it five times, then congratulations, you have teh skillz! The only twist here is that you cannot complete the series games on your own. In following the theme of 'Great Together', you gotta finish playing the first game, invite another friend to complete the second game, who'll then invite someone else to complete the last game. 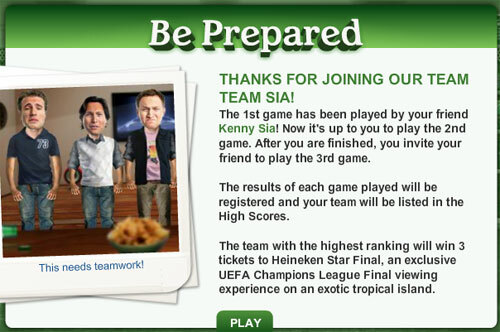 It is important that you finish the games as quickly as possible, so make sure you pick someone with teh skillz. What made these games go so over the top is that each time you completed the game, they play a funny video of a choir singing some congratulatory messages to you. As if to jokingly stroke your ego. That itself is already worth wasting 2 minutes of your life to play these games. But I'll tell you what's not a joke: The Grand Prize of this contest. 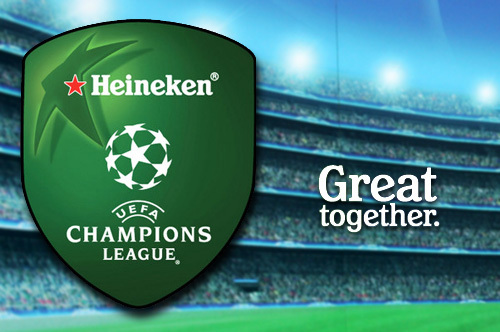 It's tickets to the Heineken Star Final: A free trip for three person to go on an exclusive holiday in an exotic tropical island and watch the the UEFA Champions League Final in style. The destination is a secret, so don't ask me 'cos I dunno! 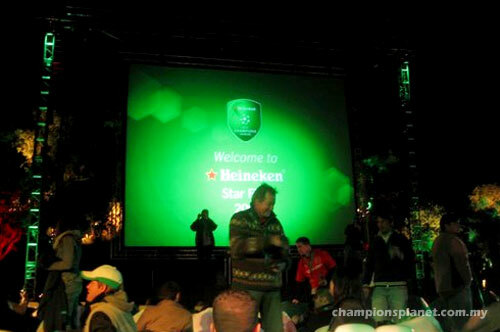 But if this year's Heineken Star Final is a good indication, where Edwin Law joined 150 football fans from all over the world in South Africa to watch Manchester United win the Champions League, then it's a pretty good chance the Grand Prize next year will not disappoint. To win the Grand Prize, first you must pull together a team of three. If you are struggling to find team mates, not to worry. There are always heaps of bored people hanging around my kennysia.com Chatbox 24 hours a day. If you ask nicely, I'm sure they'll be people there happy to join your team. Although these kennysia.com Chatboxers may be able to help you get by. But skillz, they srsly lack. your chatbox is so happening! boring ad from u. no creativity. Kenny, obv you chose the gamer nubs on the cbox. next time hit me up and i will pwn whatever flash game they challenge you at. hahah..but alot of spam there...possible to reduce will great..
Is the Amber Chia in photo no. 2? But if this year's Heineken Star Final, where Edwin Law joined 150 football fans from all over the world in South Africa to watch Manchester United win the Champions League is a good indication, then it's a pretty good chance the Grand Prize this year will not disappoint. I don't get you on this >. Thank God for blogs like yours. Kenny!!! You indirectly commented on me Epic Fail!! hahah.. I tried my best seriously!! LOL. But it's funny I have to admit! Cheers! Another ads..damn this is a boring as RTM2. i played the second time and beat the average score T_T what fail. do u know that online games has been the forte of some very well known hackers? A group of ppl has been winning online games so often that it will put u to shame......they hv collectively raked in rm200000 or more this year. So if u think u r good, think again! You will be up agianst a group of hacekrs who will put ur best effort to waste. Dont say I didnt tell u first. 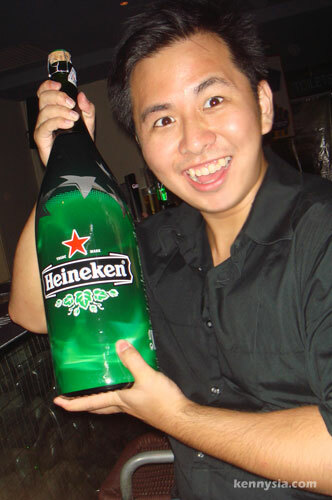 And if Kenny is seriously wanting to promote for heineken, i suggest he alert Heineken as well. btw Kenny.. Are you going to join the treasure hunt? ngaiti, so few people comment one. More people commented on www.crazyfool2986.blogspot.com than kennysia.. enjoy..
23rd of November is a Sunday, Kenny. There will be setbacks, and false starts. There many who won't agree with every decision or policy I make as president. And we know the government can't solve ever problem. But I will always be honest with you about the challenges we face. I will listen to you, especially when we disagree. Above all I will ask you to join in the work of remaking this nation, the only way it has been done in America for 221 years, block by block, brick by brick, callused hand by callused hand. What began 21 months ago, in the depths of winter, cannot end on this autumn night. This victory is alone not the change we seek. It is only the chance for us to make that change. we rise or fall as one nation, as one people. Let's resist the temptation to fall back on the same partisanship, pettyness and immaturity that has poisoned our politics for so long. Let's remember that it was a man from this state who first carried the banner of the republican party of the white house, the party founded on the values of self reliance, and individuality liberty and nation unity, those are the values we all share. While the democratic party has won a great victory tonight, we do so with a measure of humility and determination to heal the divide that has held back our progress. As Lincoln said to a nation far more divided than ours, we are not enemies, but friends. Though passion may have strained, it must not break our bonds of affection. To those Americans who's support I have yet to earn, I may have not won your vote tonight, but I hear your voices. I need your help. And I will be your president too. To all those watching tonight from beyond our shores, from parliaments and palaces, those who are huddled around radios in the forgotten corners of the world, our stories are singular but our destinies is shared. The new dawn of American leadership is at hand. To those, to those who would tear the world down, we will defeat you. To those who seek peace and security, we support you. To all those who have wondered if America's beacon still burns as bright, tonight we prove once more, that the true strength of our nation comes not from the might of our arms or the scales of our wealth, but the enduring power of our ideals, democracy, liberty, opportunity, and unyielding hope. It's the answer told by lines that stretched around schools and churches, numbers this nation has never seen, my people who waited 3hours, 4hours, many for the first time in their lives because they believe this time it must be different. That their voices could be that difference. It's the answer spoken by young and old, rich and poor, democrat and republican, Black, White, Hispanic, Asian, Native American, gay, straight, disabled and not-disabled, Americans who sent a message to the world that we have never been just a collection of individuals or a collection of red-states and blue-states, we are and always be the united states of America. It's the answer, that led those who have been told for so long, by so many to be cynical, and fearful and doubtful about what we can achieve, to put their hands in the arc of history, and bend it once more towards the hope for a better day. It's been a long time coming, but tonight, because of what we did on this day, in this election, at this defining moment, change has come to America.